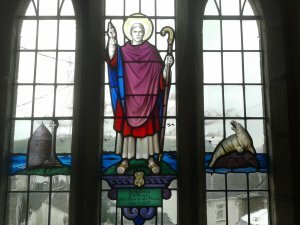 St. Mawes himself was principally associated with Brittany where he was greatly revered and is the patron of numerous churches and chapels. He is known there as St. Maudez, the latinized form of his name being Maudetus. By very uncertain tradition he came from Royal parentage in Ireland, but he is more reliably reputed to have “traversed the north of Brittany, accompanied by a great multitude of people who obeyed his saving words” and to have finally settled on a lonely island, near the Ile de Brehat off the coast of Brittany, from which he could easily have sailed across on a missionary journey to Cornwall and landed at St. Mawes. 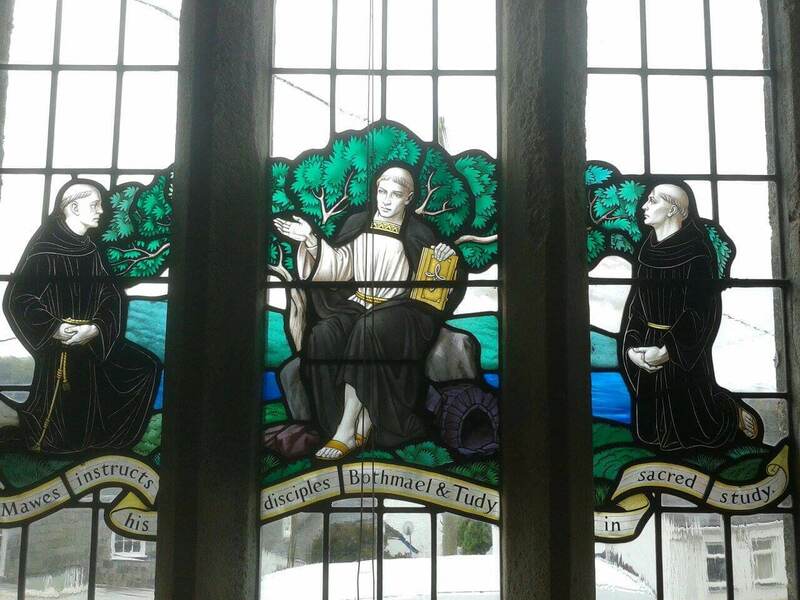 He is depicted in the three windows in his respective characters as teacher (Leland who visited Cornwall in the reign of Henry VIII calls him a “scholemaster”), Abbot (or Bishop), and missionary. 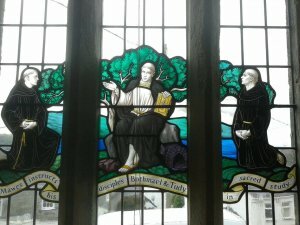 In the left –hand window we see him seated on his stone chair, under an ancient white thorn tree, instructing “in the service of God and in sacred study” his two disciples, Bothmael and Tudy – both also known in Cornwall, the former as St Budoc, patron of the parish of St. Budock which adjoins Falmouth, and the latter in the parish in North Cornwall bearing his name. 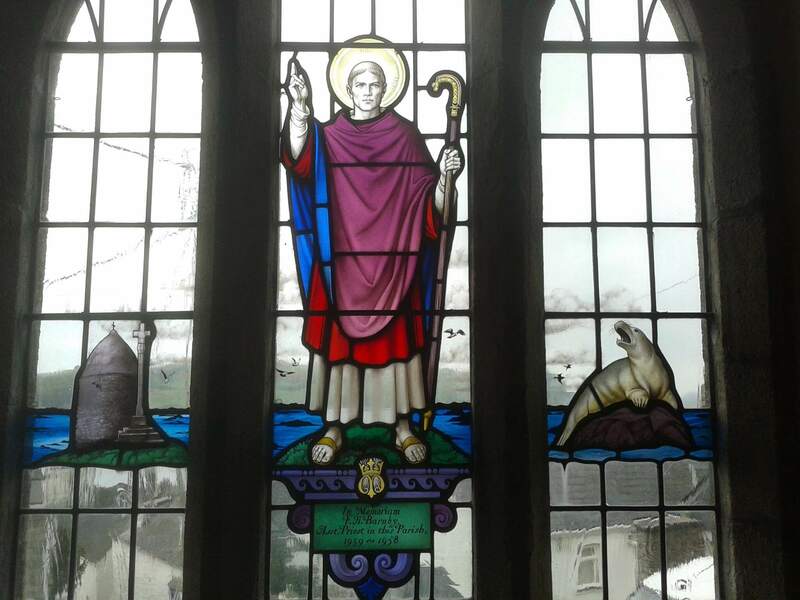 In the central window St. Mawes is depicted as Abbot (or Bishop) against a background of rocky Breton islands. The figure is taken from the remarkable statue on the church of Egrue-Gaberic, near Quimper. 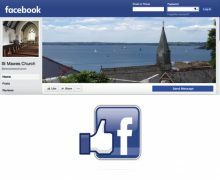 The existing round tower known as “Forn Modez” on the Ile Modez and the “Cross of St. Maudez” on the Ile de Brehat are also shown. The seal sitting on a rock is the subject of one of the more fantastic legends. A certain demon whom the Bretons called Tuthe appeared in the form of a sea monster and disturbed the Saint and his disciples in their studies and prayers. The Saint kept watch and eventually drove it away. 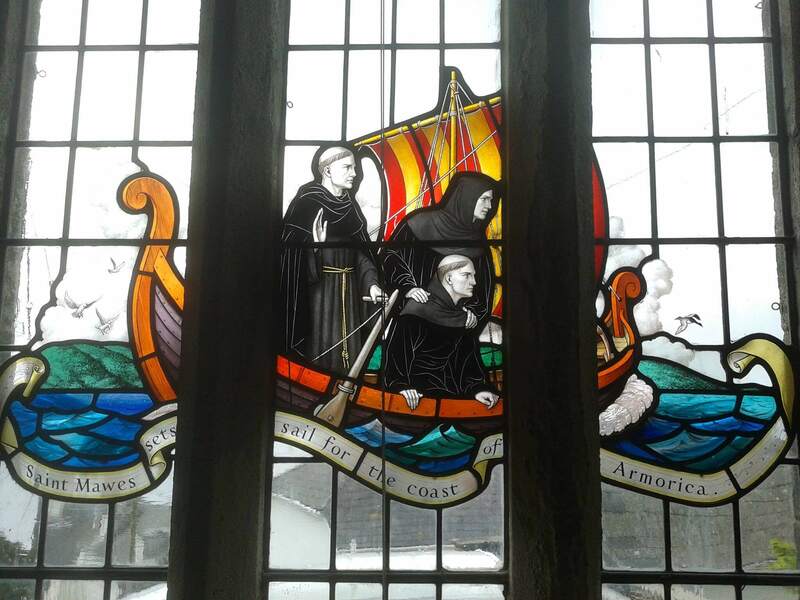 The right-hand window depicts the Saint setting out, with his two disciples, on a missionary journey to Armorica – ancient Roman name for what is now Brittany. 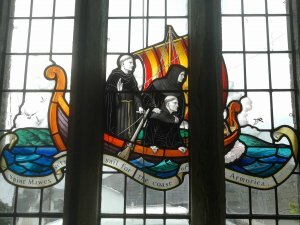 Such is the mixture of history and legend which forms so charming and fitting a memorial to Frederick Harcourt Barnby, schoolmaster and priest, and one with a true mission to St. Mawes which he loved so well and where he will always be remembered with gratitude and affection by those to whom he so faithfully ministered.